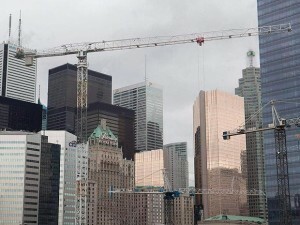 George Carras, the President of RealNet Canada Inc. explains why the prices of new condos in the GTA appear to have decreased since last year, in the following article written in TheStar.com. “New condominium prices in the GTA have declined by 6.4 per cent from last year, according to RealNet’s Highrise Index Price. What’s the primary reason for this price decline? Is it the tightening in mortgage rules? An oversupply of new housing? Perhaps, you might think, it’s because development costs have decreased. The actual reason for the decline in the price of a new condominium can be captured in a word that will be familiar to Seinfeld fans: shrinkage. New condominium prices are lower because the units being offered for sale are smaller. How much smaller? In 2009 the index size of a new condominium was about 920 square feet. At the midpoint of 2012 the index size was about 795 square feet. That’s a decline of approximately 125 square feet, the equivalent of removing a 10-by-12-foot room from that 2009 condo. This shrinkage has been consistent across all condominium unit types and in both the 416 and 905 regions. There is a significant shift taking place. Back in 2000, apartment condominiums represented only 23 per cent of the overall new-home market; detached homes outsold condominium apartments by a ratio of two-to-one. In 2005, intensification policies contained in the province’s regional growth plan took effect, triggering an increase in highrise condo development to meet the demands of a region that continued to grow. Fast forward to 2012. Today, 51 per cent of total new-home sales are apartment condominiums, and condos have been outselling detached homes by a ratio of two-to-one. This is based on the supplies of the two housing types. After all, builders can only sell what they’re permitted to develop.